Once again, we find that a comic writer with lots of time on his hands has taken what we already know and put it into book-form to sell for money. 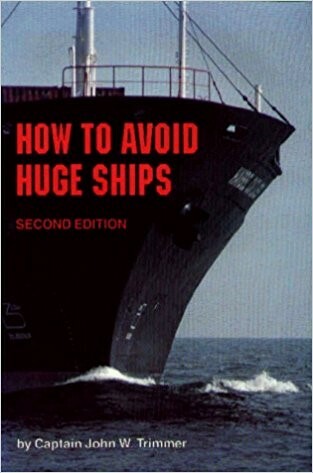 How to Avoid Huge Ships – Second Edition really makes you wonder what the cap’n didn’t add in the first edition. This book is ideal reading material for people who are forced to spend most of their time in the immediate vicinity of huge ships and are allergic to ship-to-ship collisions. Lucky for us, if you read between the lines, you can implement the same principles taught in the Captain’s book and apply it to avoid other huge vessels and modes of transport, but won’t help against anything smaller than a diesel bus. If you think this 112-page manual would’ve helped the captain of the Titanic survive its maiden voyage, then you’d be wrong. It crashed into an iceberg, not a huge ship.